Hello amazing Friends, and thank you SO much for all the well-wishes on our new home! We feel so blessed! If you missed it, I shared the grand tour on Tuesday. (See it HERE.) We didn’t waste any time getting in there and getting started. 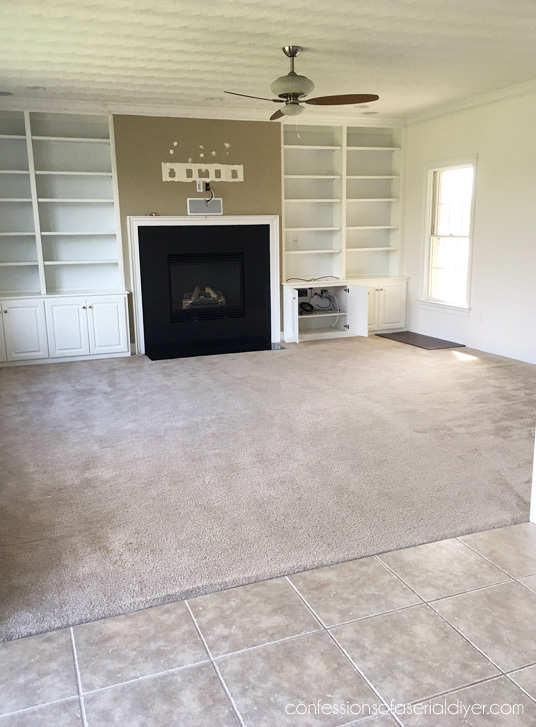 I thought I’d stop by today and share what we were able to get finished before the big move. 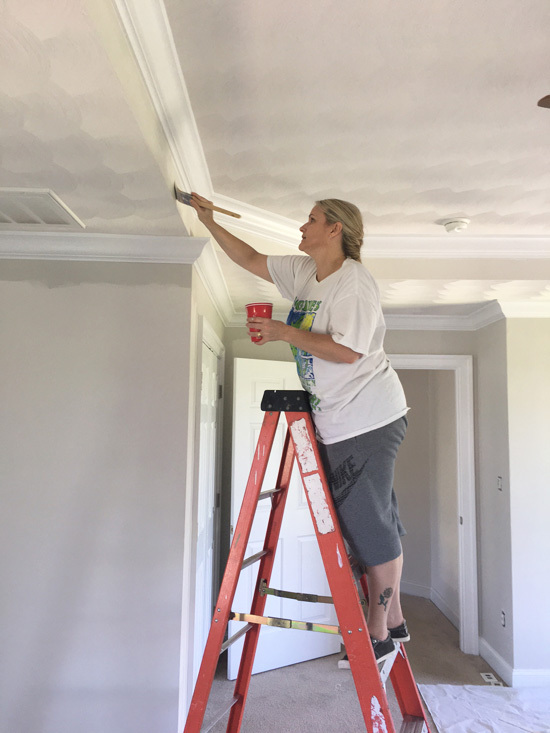 While they were working in the living room, I got started painting the master bedroom. 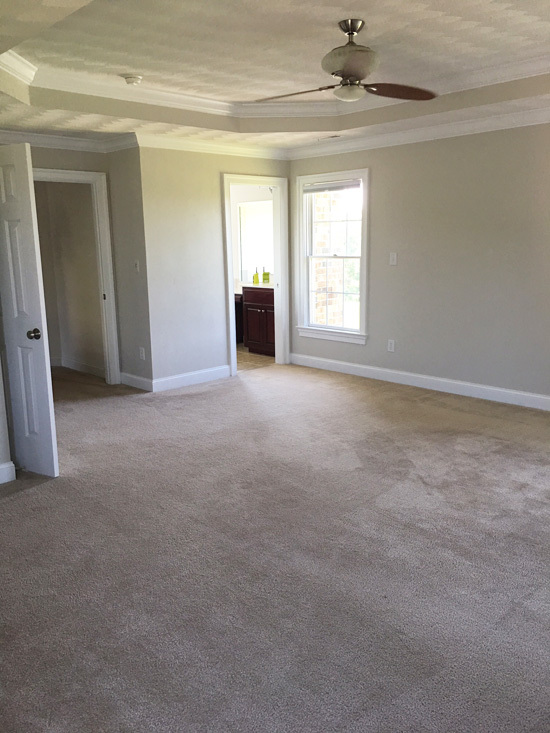 I figured if we could get the master bedroom and the living room at least painted before move-in day, that would be awesome since the bulkiest furniture is in those two spaces. I gave all the trim a fresh coat of Behr’s Ultra Pure White to freshen it up. The original white trim was quite dull in comparison. That took most of Saturday because there was so much trim! Then I rolled on the new paint color. We finished on Sunday. I thought for sure Silver Ash would be the one, but it was too green for me. Campfire Ash was perfect! My sister and I moved onto the living room next and she stayed late Sunday to help me get it done (Actually she made me stay and get it done! ), so I could start laying my floors on Monday. I wanted to use the same floors I used in my current home, but Lowes no longer sells the same color, so I went with a darker shade this time. This is the Barrel Hickory color by Style Selections from Lowes (found HERE), and they are engineered hardwood. I was able to get them finished by Tuesday. I love the contrast of the dark floors and the color on the walls. They actually don’t look quite this dark brown in person. They look more like they do in that link I shared. I’ll be installing these same floors in my office and the dining room eventually as well to keep it cohesive. I took pictures along the way to share how easy it is to install a floating floor yourself since I got several questions about my last floor install. I’ll share that soon. I didn’t share the process the fist time around, but you can see the chaos I did share HERE. I have my white slip-covered sectional going into this room, so there will be a lot of light elements. I think the dark floors will help ground the space. It is very soft and subtle, just what I wanted to keep the space light and airy. We still are undecided about whether we want to hang our TV above the fireplace or not. Any thoughts?? I’d love to hear them! Lot’s to sort through, but I was dreading that job, so I am SO very grateful!! Now we can do whatever we want and the new neighbors can’t see! He hung 16 of them without stopping. That was a huge help! The shades I chose are these cellular shades by Allen & Roth from Lowes. I like that they look almost like nothing when they are pushed up. We’ll see how I like them over time. I am so grateful to all who helped get the new house ready for the big day. We officially move in tomorrow. My hubby has been bringing truckloads of boxes over every day after work and the boys and I have emptied out all of our closets and made several trips with lots of loose items, so the movers can get all the big stuff moved as quickly as possible. Still not nearly swim-ready, but at least it doesn’t look like a swamp anymore. My sister and I skimmed out as many baby frogs as we could find before he shocked it, but sadly there were still many casualties. Sorry, frog babies. Yesterday I was able to get all the drawers and cabinets in the kitchen lined and ready to be filled. Today I will be taking beds apart, removing the legs from the dining room table, moving all the pantry items over, and whatever other last minute things need to be done before the movers get here. We have a busy busy weekend ahead! 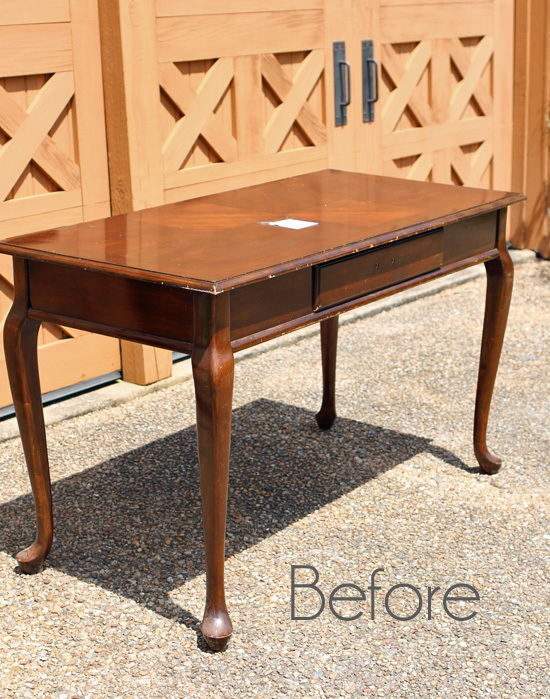 UPDATE: Check out how this hotel-esque desk turned into a beautiful dressing table HERE! I Love the darker color of the flooring, I think it is beautiful. 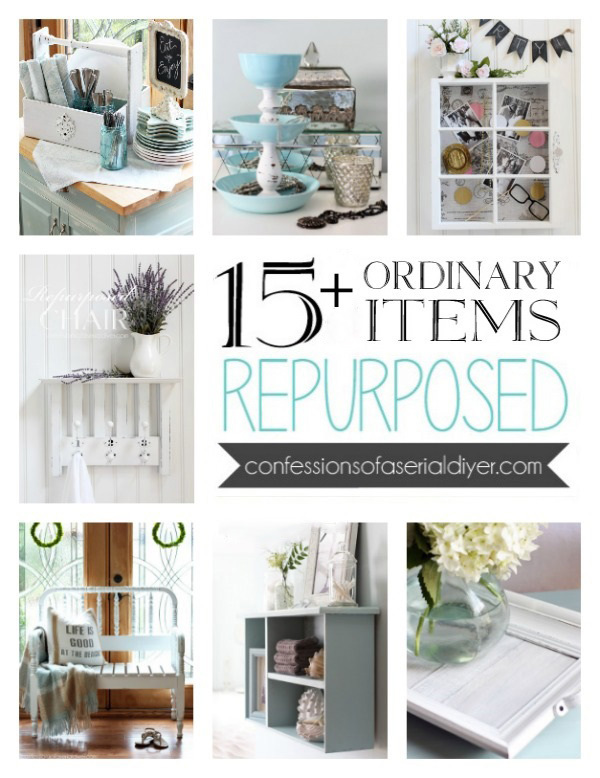 Can’t wait to see your pretty things in the home. Have fun decorating your new home, it is so fun to decorate once every thing is moved. Have y’all ever been busy. Moving is such a huge job. 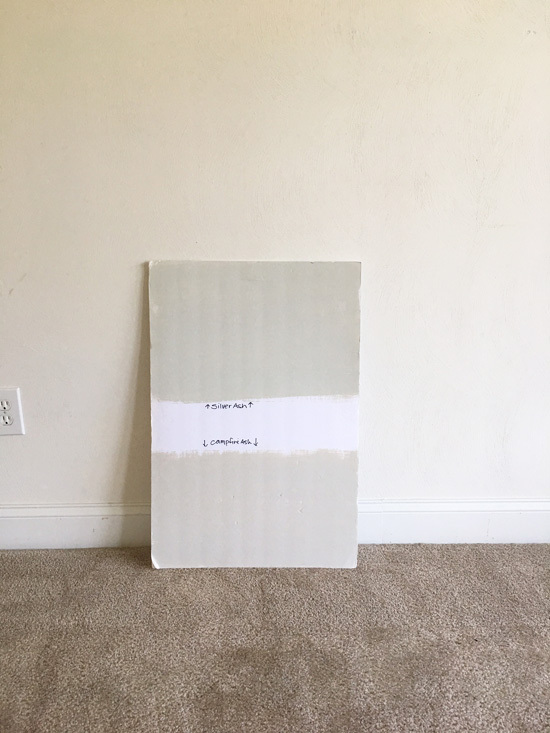 I love the floors and paint colors. I knew when you got your personal touch to the house it would look great. Good luck tomorrow- how lovely it will be to wake up in your lovely new home Saturday morning. SSQQQQUEEEEEEE!!!! What a fabulous home and helpers! Love the living room floor and the paint colors are perfect. HUGE hugs to you and all your helpers. Love your new home. Love the colors you picked. 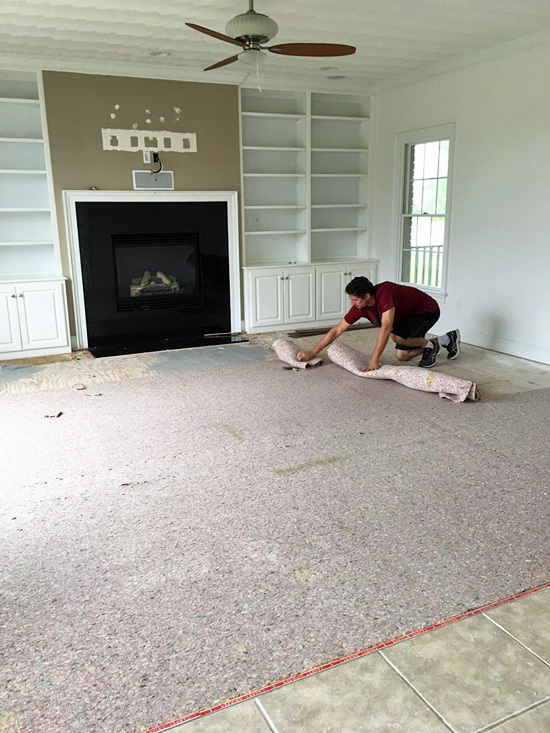 Can’t wait to see the finished move….then you can rest! I love the dark floors. 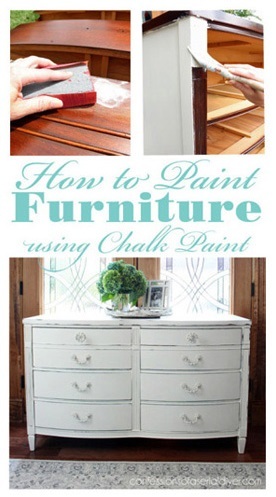 It will make all your light-colored upholstery pieces pop! Thank goodness for family…they did so much. I like plain windows (your shades.) Shades are a functional item…not decorative,,should be discreet, out of sight. (my opinion.) I know you will make this home tasteful as your other house. I will enjoy all your future work. This is a whole new “canvas” for your imagination and creativity. So happy for you! I love to decorate my mantle so I would never hang a tv over it. To me, it looks tacky (sorry!) and would be a waste of one of the few decorating spaces I have that the cat doesn’t touch 🙂 I also like to place my tv in a spot where there is no window glare because that drives me bonkers! I love your new house and look forward to seeing what else you do here. How nice to have such a handy family! Renovating seems to run through the generations. The house is looking great already and will continue to reflect who you are. Don’t try to do too much, especially right after you move. You need some time to relax around that pool. Remember that it took time to get your old house where it was and enjoy the process. Nobody’s expecting you to live in a magazine set (although your “after” photos in front of those magnificent glass doors sort of look like you did 😉). Yay for family willing to help! Where would we be without them? 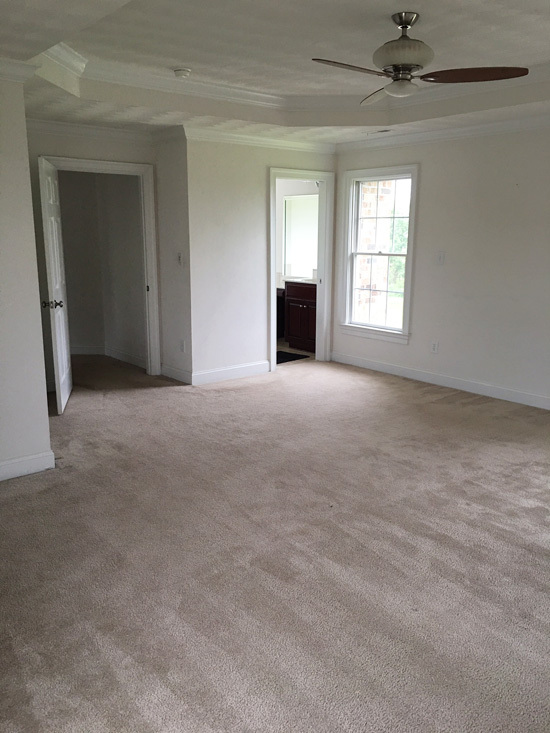 The two rooms look great but I’m trying to figure out the ceiling (sorry, not being critical just curious). Love the color you chose. As for the baby frogs, had they been in a pond, a lot would have gotten eaten by fish so try not to feel bad. It’s looking good! As for the tv, guess it depends on if you want to be able to decorate the mantle and if you have a good alternative spot. Good luck with the move! Love the flooring you chose! I really want to rip up the carpeting in my living and dining room but my basement is unfinished and cold. I am not sure I want to take on flooring and insulating! I can’t wait to see the ” Christy touch” on the new house! You are blessed to have all these great helpers. I dont know that i could leave your beautiful garden at the current house. I can hardly believe all the progress you’ve made. WOW! Your floor looks great. 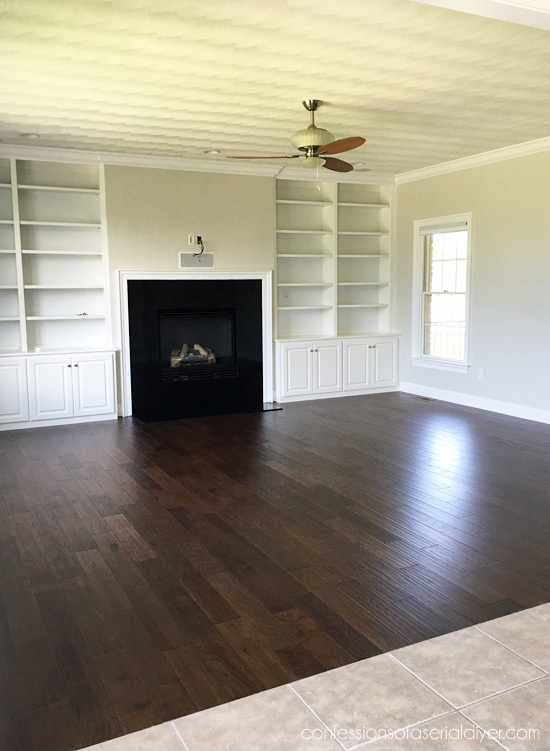 I also chose a dark Hickory stain floor and light walls. I want to weigh in on your TV above the fireplace. I have had it in both places in my home. Sometimes,aesthetically, it seems better over the fireplace. ( and you do see this type of installation everywhere) However, ergonomically, it is so much better to have it closer to your sitting eye level. This becomes really evident for anybody with bifocals. Looking up all the time is quite unatural for the neck and back. I would try hard to keep it lower. Christy it’s looking so much better already! 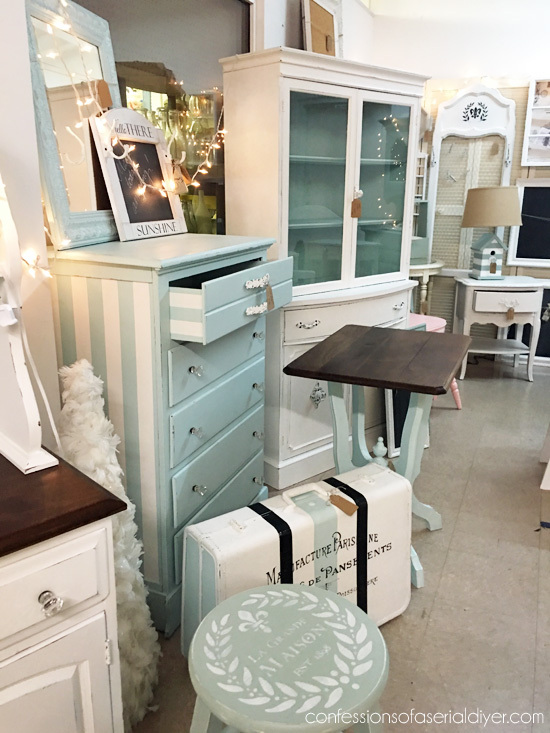 Those floors are gorgeous and I love the color you picked for your bedroom! You all should be BBQing and swimming before the end of the summer for sure! Thank God for family! They’re always there when you need them the most! Keep posting, this is very exciting seeing it from the very beginning! I am searching for flooring for a spare bedroom. 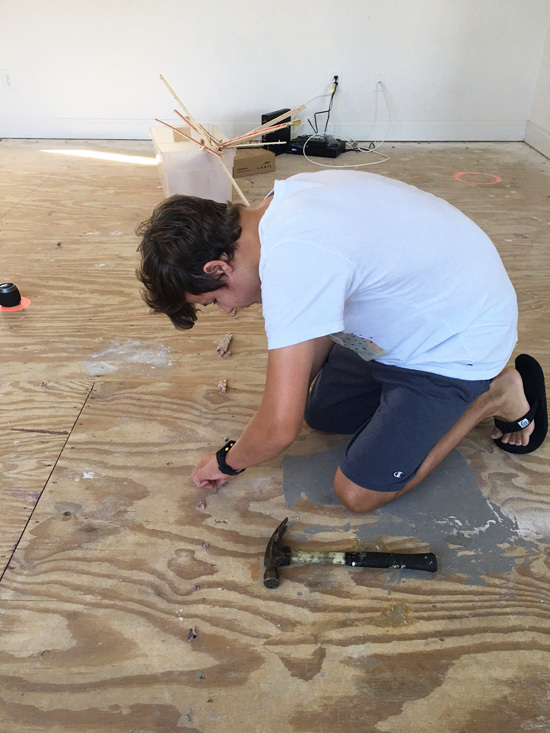 Can you give me your pros and cons of the flooring you picked, does it hold up good? Lovin your house already and so glad you have so much help in moving in. So excited for you and your family! Great to see family helping too! I’m sure you will have everything looking beautiful soon. God bless! I say,”NO!” to the TV above the fireplace. A nice picture above it with the TV on the bookshelf beside the fireplace is a better placement. My vote is no! No,no, no, TV above the fireplace! First of all it is too high and you’ll get a crick in your neck. Second of all, you need something beautiful about the fireplace to bring color into the room and to enjoy each day! Can I just say…I’m TIRED for you!! I admire your energy, no joke. 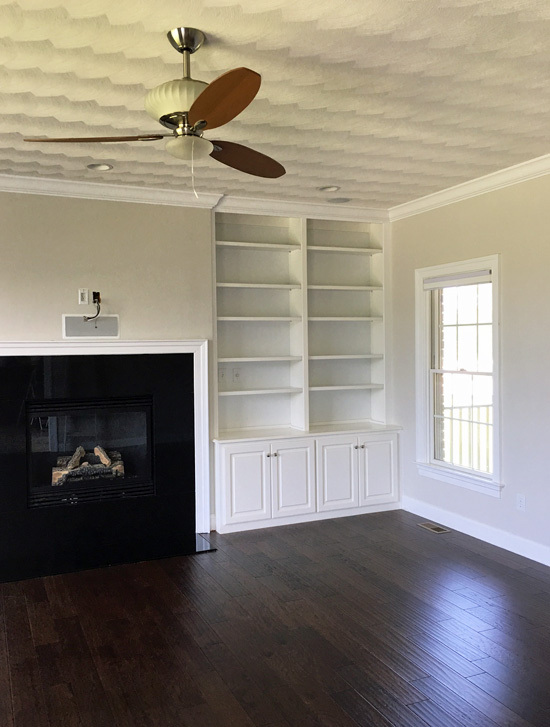 Thanks for sharing this exciting new start in your new home. I look forward to seeing it all come together over time, with all you talent and imagination I’m sure it will be inspiring. What wonderful support from your family too. Congratulations, many happy times and new memories are waiting. Love it all, Christy! The paint color looks lovely. I’m going to go check it out for my place. I was thinking about Burnished Clay, but maybe cutting it by 50%. But your color looks great, too! Looking forward to all the fun things you will have to share! Make sure to rest! Regarding the question about the TV over the mantle… Have you seen what Yvonne at StoneGable has done with hers? It’s definitely an option. 🙂 Kinda like it. Take a look at her post today. She makes mention of it. Christy, you have a great family to help you like they have, you’re very blessed. The house looks amazing and I want to wish you and your family best wishes in your new journey. Loving all the updates you have made so far! You are very fortunate to have so many wonderful helpers in your family. Loved the photo of your son in the closet!! The swimming pool is truly fabulous. As far as hanging the TV over the fireplace, I am against it because #1 it’s a fad that seems to be passing, and #2 it’s too high up and might make your neck hurt if you’re watching for any length of time from down on a sofa. A benefit of putting it over the fireplace is that you could see it easily while you’re in the kitchen. Only you guys can decide what you like best! It all has come together quite nicely! I am glad the pool is perfect now for enjoying hot summer days! Oh girl! It’s BEAUTIFUL! I wish I was still full of the energy you have. Age has a way of changing that. I say hang the tv, it will be up out of the way and save on space. I LOVE LOVE LOVE the dark floors. They look very rich, classy and welcoming. Perfection! Christy, I greatly enjoy your blog and have learned a lot from you. 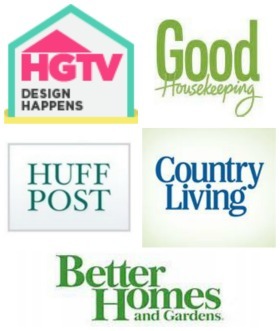 Your new home looks like it has lots of possibilities, BUT you need a mantle!!!!!!!!! Please tell me you have plans for a mantle! All the best with your move tomorrow. Wow, you guys are truck’n along quite nicely and you sound very organized, Christy. 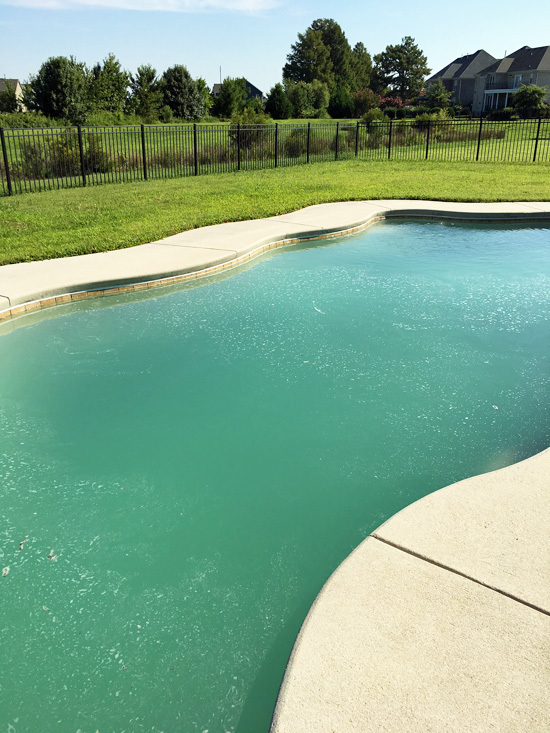 I’m green (like those frogs) with envy over that lovely pool – your boys are going to love it. 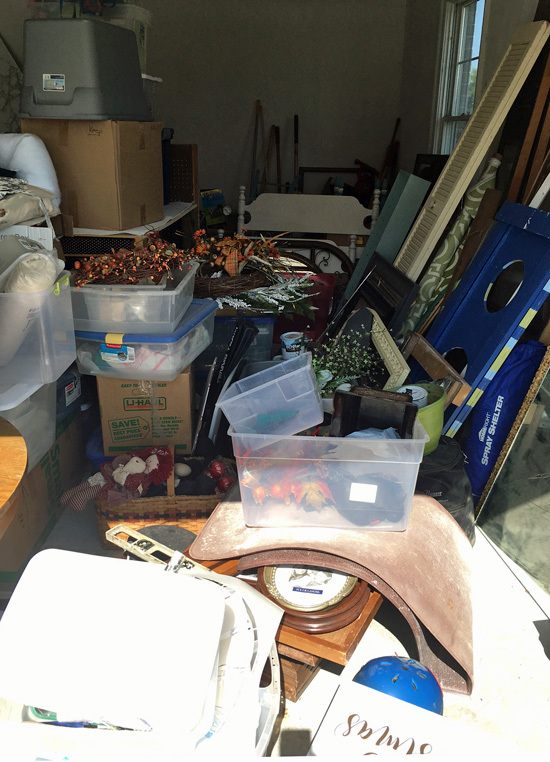 Moving – ugh, but all worth it in the end. You are making GREAT progress. I love the gray you picked and the white trim is great with it. That dark wood floor looks fabulous. Nice to have so many great helpers, too! Wow Christy, what a beautiful home and so much space. This is the first time I have seen it and I am so happy for you and your family and speaking of family, girl how lucky are you, wonderful. I love your new floors they are gorgeous, and I personally chose not to have the tv mounted on the fireplace, #1 it would have made it to high and #2 I like to decorate my mantle, I almost forgot I really love the paint colors so very pretty. Your new home will be a showstopper by the time you put your special magic on it and I can’t wait to see it. So very happy for you and family, can’t wait to watch as you make it your own. Blessings for wonderful memories there. I find any tv above a fireplace is not comfortable for viewing when sitting. 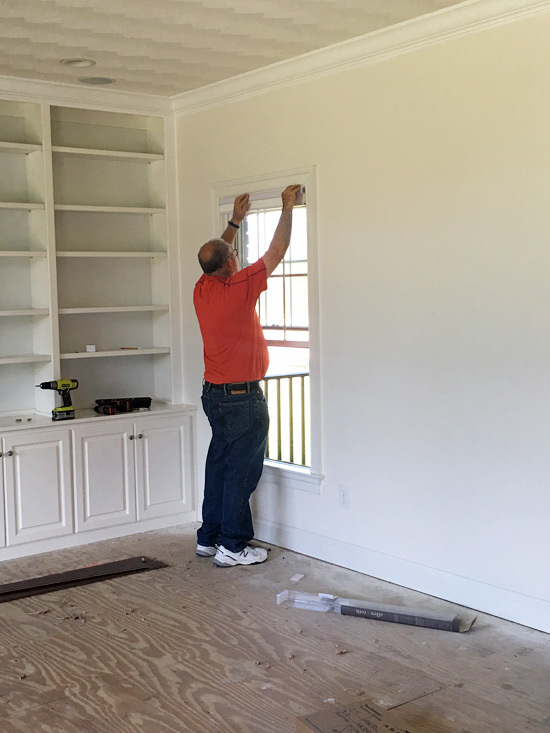 If that was my house I would retrofit the bookshelves right above the cabinets to accommodate the tv. I would still use a wall bracket if the tv needs to swivel for everyone to see or just have it sit on the cabinet. Even though it would take some carpentry and moving of wires – to me it would be worth it. I have seen some pictures on Pinterest. 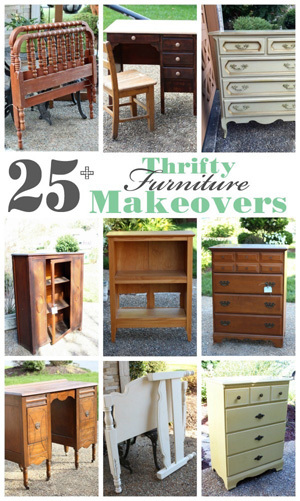 Recently discovered your blog and really enjoy your makeovers. Christy, sit in a chair where your sofa will be and look above the mantle. If you have to move your head up, then I would find an alternative. We had to move our tv from above the mantle because looking up was straining my neck – it is now at eye level. I placed it on the wall next to the built ins and it goes flat against the wall(or you can recess it) And then I can pull it out or angle it any way I want. Just wanting to thank you for your inspiration on the window coverings. We went right out and got six for our 60″ wide windows. OH what a difference they make in our cottage home. When we bought the house in a new development, we all favored the wooden slat pull-ups for the craftsman style, however, they made it dark. My question now is how do I (5′ 2″) ever reach the top to pull down the shade and put it back up? Looking for a solution now. We can but handles, but still need to be over 5’2″ to reach it. Thanks for your help. I vote no to the TV above the fireplace. The center of the TV should be about 42 inches above the floor and couch distance from the screen depends on the size of your TV. Crutchfield has a great explanation for optimal TV placement: https://www1.crutchfield.com/learn/learningcenter/home/TV_placement.html Can you tell my husband is a little bit obsessed with this kind of thing and therefore I now know all about it??? Ha! Ha! Just my opinion but I hate the tv over the fireplace look. Of course in our house that we built from our own plans we have a separate den and the tv is there (I’m a huge sports fan so the den can stay “comfy” even when guests come over in the living room). The main rooms are not huge so our large flat screen would have overwhelmed the l. r. and the cabinet that would have “hidden” it wouldn’t have – it would have just said look at me I’m hiding a huge tv 🙂 I wanted to be able to entertain in a room that was for conversation, not tv watching. But most people I know do have one in the l. r. (and the bedroom which I don’t do either). One concern is a gate around your pool. I used to work for a pool company and at least here in AZ they were pretty much a legal requirement, so please check into that for safety purposes. Your house looks wonderful and how great to have family time while you’re working so hard! You have the best family! I can just see them all at your house (once you’re all settled and decorated) around the dining table, enjoying a good meal and a good visit. 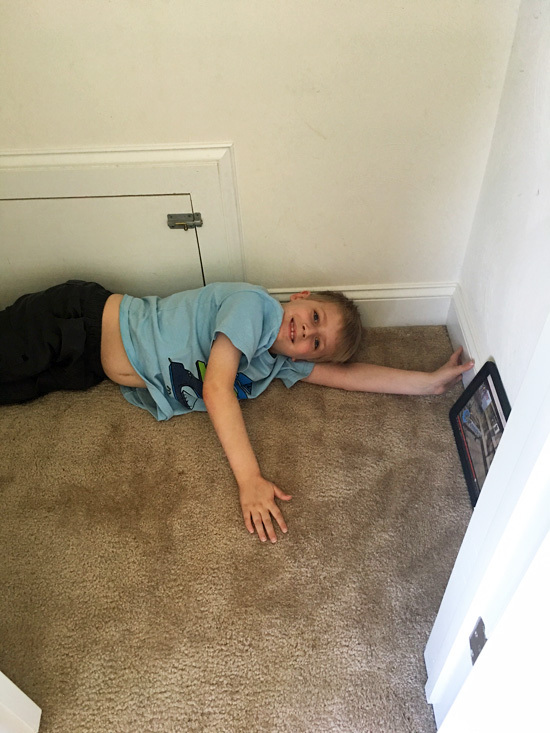 Love the floor…big, huge, enormous improvement over carpet.